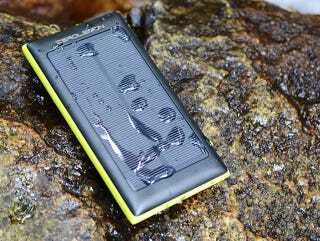 The ZeroLemon SolarJuice is the ideal backup battery pack - it’s shockproof, water-resistant, and has a solar panel for extra power when you’re on the go. Right now, Gizmodo readers can grab one for 40% off - just $29.99 + free shipping. The ZeroLemon packs 10,000mAh of portable power - enough to charge your phone multiple times over without the need for an outlet. With 3 USB outputs, you can quickly charge up to multiple devices at the same time. It comes with a solar panel that can provide some extra juice when you’re on the go, or fully charge the unit in case of emergency. Best of all, this thing is nearly indestructible - it’s shockproof and water resistant, but still compact and lightweight. At just $29.99 (40% off), the ZeroLemon gets you the most bang for your buck. Head to the link below to grab yours. If for any reason your item isn’t working as promised, you’ll be covered by ZeroLemon’s 180-day guarantee. Shipping is free, but only available within the US. Hit the link below for more details and grab yours today.